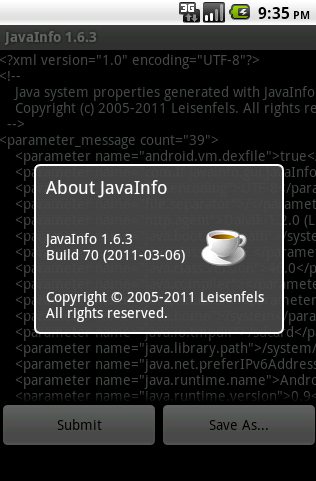 For Android mobile devices (smartphones, tablets) please download the JavaInfo.apk directly from your device. Alternatively, you can copy the Android package file on the SD card of your device. Then open and install JavaInfo using a file manager like ASTRO. 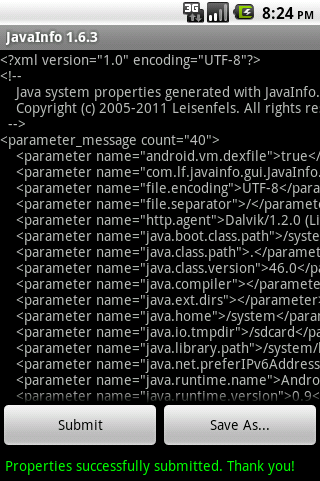 Running JavaInfo on Android requires Internet access for the system properties to be submitted to the Leisenfels web service. In addition to that, it requires access to the external memory for the properties to be stored on the SD card.